I'm not diseased, therefore I'm not contagious. I'm not a mother, but that doesn't mean I don't know how to mother. I'm not jealous, so don't act like you have something worth being jealous over. I'm not broken, so please don't try to fix me. I'm just a girl who loves a boy. I'm just a girl who is excited to start a family. I'm just a girl who has a few things to say. I'm just a girl... who is dealing with infertility. We're on our 3rd round of IVF. We have been waiting since our miscarriage in February to get started. Currently, I am on birth control to get my body ready to produce lots and lots of eggs. I have no problems producing eggs. As my AMAZING Doctor once said &#x201c;She puts my other patients to shame.&#x201d; Maybe when people make condescending comments I should fire back &#x201c;Please, you can only produce one egg a month. I can produce 20. Top that.&#x201d; On June 9th, I will start Lupron injections. Lupron basically induces menopause. The goal is to stimulate my ovaries to produce a lot of eggs. What we don't want is for my body to naturally ovulate and release the eggs on its own. That's where Lupron comes in. It prevents my body from releasing the eggs. On June 25th (yes, my birthday and the one year anniversary of Michael Jackson's death) I will start Gonal-f injections. Gonal-f will be my friend for about 12 days. After that, it's egg retrieval and embryo transfer time. I'll explain all of this in detail as time goes on. Misconception #1: Infertile means Sterile. 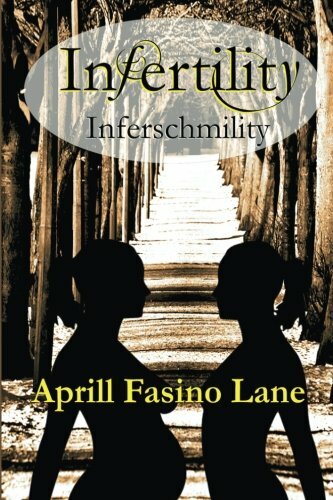 (This book takes you along with Aprill while she and her husband battle infertility. The facts, the joys, the disappointments, the treatments, the emotions, and the outcomes. You will cry. You will laugh. You will cheer. You may find answers. You will be amazed at the amount of information that is contained in this book.) It is time to clear the air!